Dr. Shirley K. Osterhout came to Duke University in 1949 as an undergraduate. 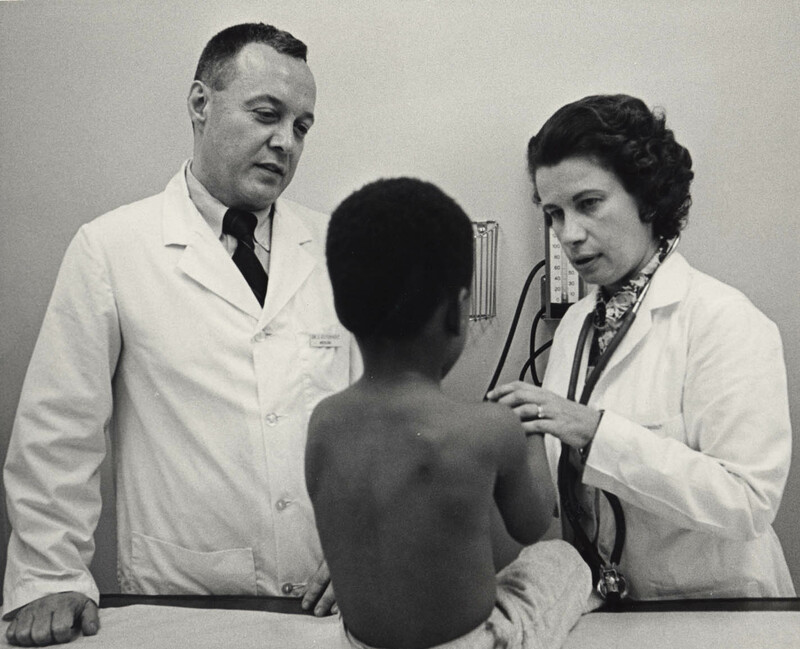 She obtained her MD from Duke in 1957 and continued in the Department of Pediatrics, working closely with Dr. Jay Arena on poison control issues in her residency. As Dr. 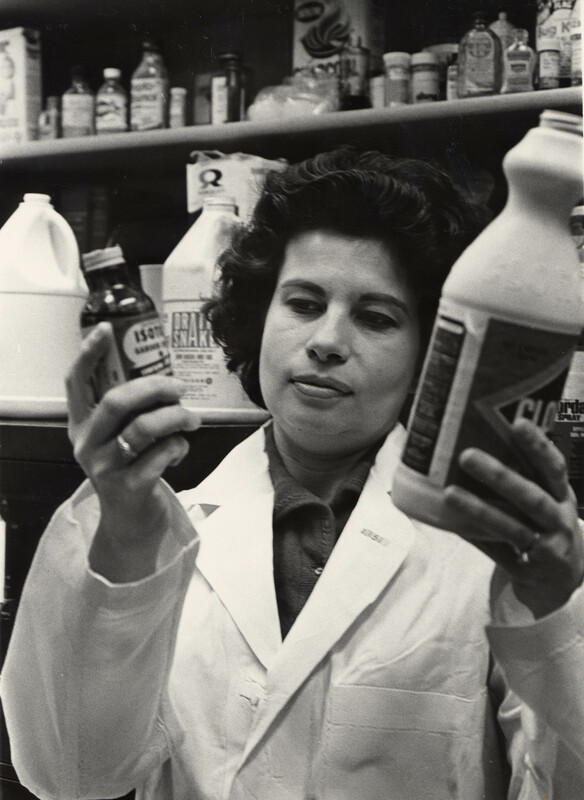 Arena began to pursue poison control and safety issues on a more national scale, Dr. Osterhout undertook more and more responsibility in leading the Duke Poison Control Center serving as assistant director (1960-1970), clinical director (1970-1985), and medical director (1985-1995). 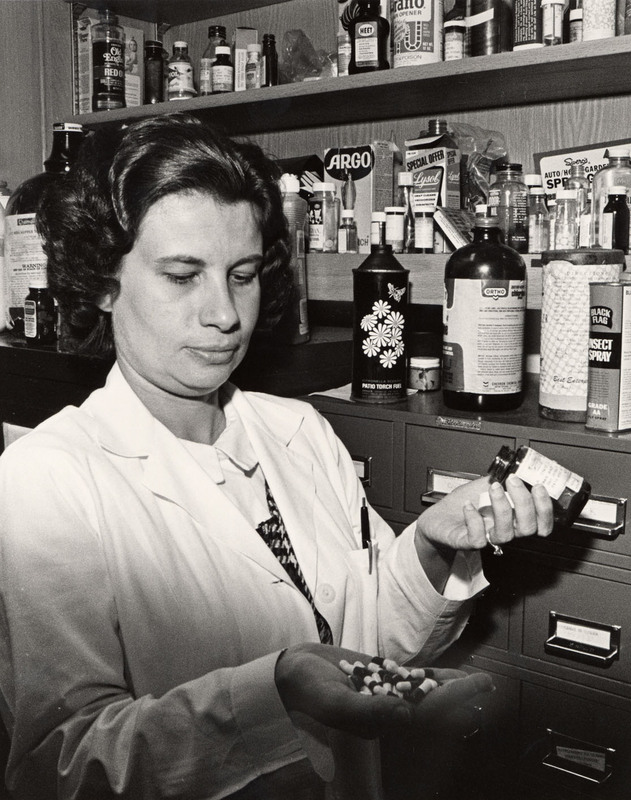 She also served as assistant dean of medical education at Duke University Medical Center (1971-1987) and in numerous consultant capacities as a poison specialist outside of Duke University. She retired in 1995. Dr. Osterhout also worked part time as a Duke pediatrician while she was supervising Poison Control Center. She's pictured here with her husband, Duke physician Suydam Osterhout, and a patient. Dr. Osterhout investigates household products in the Duke Poison Control Center. 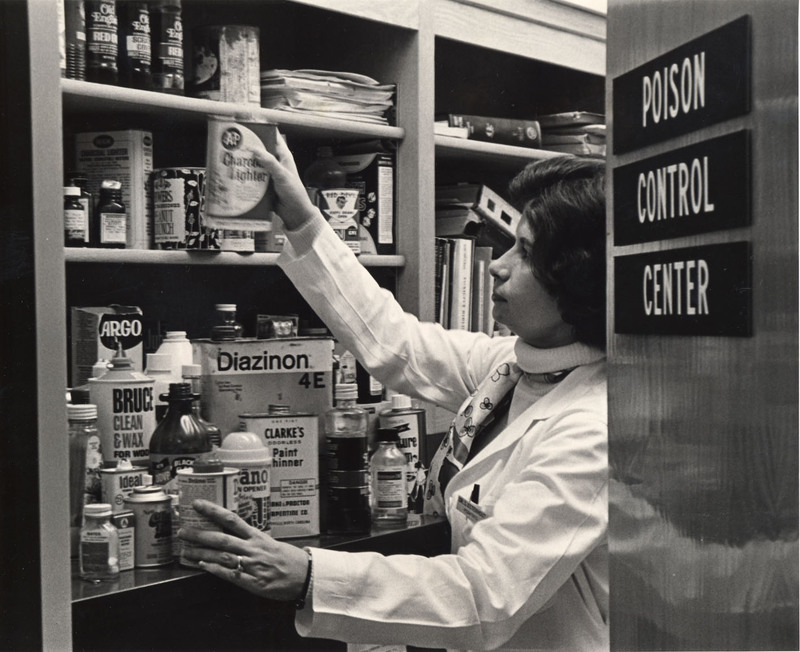 Dr. Osterhout examines household products in the Duke Poison Control Center. Dr. Osterhout studies medication capsules in the Duke Poison Control Center. The Poison Control Center moves its files from a shelf in the pediatric resident's office to an entire filing cabinet in a treatment room in the ER. 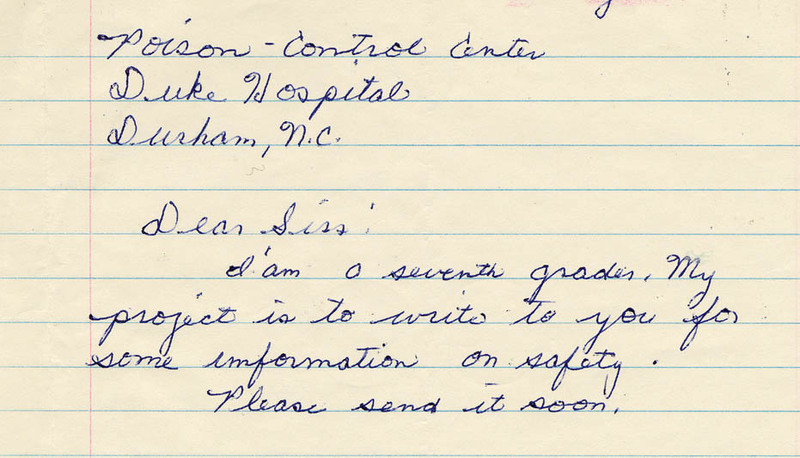 The Duke Poison Control Center, officially named such in 1954, received calls and letters from persons with emergencies or questions regarding poisonings. Examples of calls included parents of children who had swallowed hazardous household products or adults themselves who had drunk toxic substances that had been stored in inappropriately labeled containers. Farmers and farmworkers were often in need of assistance in summertime due to their frequent contact with insecticides. Other requests might require an investigation into certain wild berries or the lead in piping of moonshine stills or into combinations of drugs for a local physician's patient who had tried to commit suicide. Often in the case of serious calls, the Poison Control Center would give initial advice as to the substance ingested and then direct the caller to contact a local physician for treatment. The Poison Control Center was not itself a treatment facility. In 1954 the center received 154 calls. By 1983, there were approximately 6000 calls per year and 1000 more persons writing or calling the director personally. Listen to Dr. Osterhout talk about the geographical range of callers to the PCC. 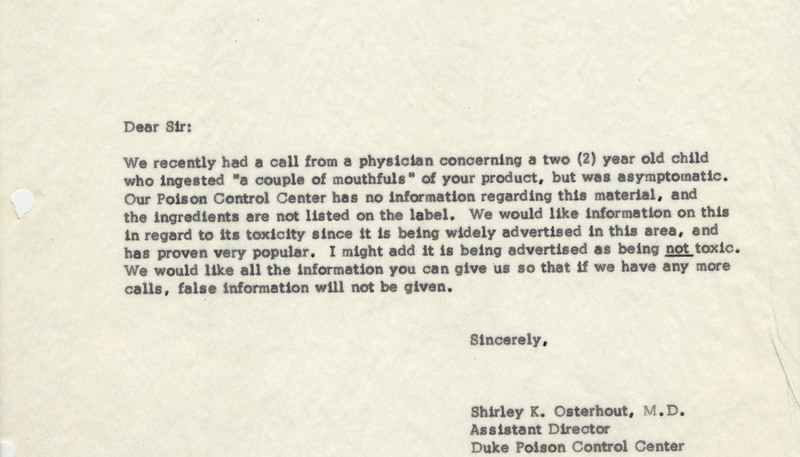 Body of a 1965 letter from Dr. Osterhout requesting that a manufacturing company send toxicity information. Many written requests were from students doing projects on poisoning or safety topics. A written request from a beekeeper, 1967. 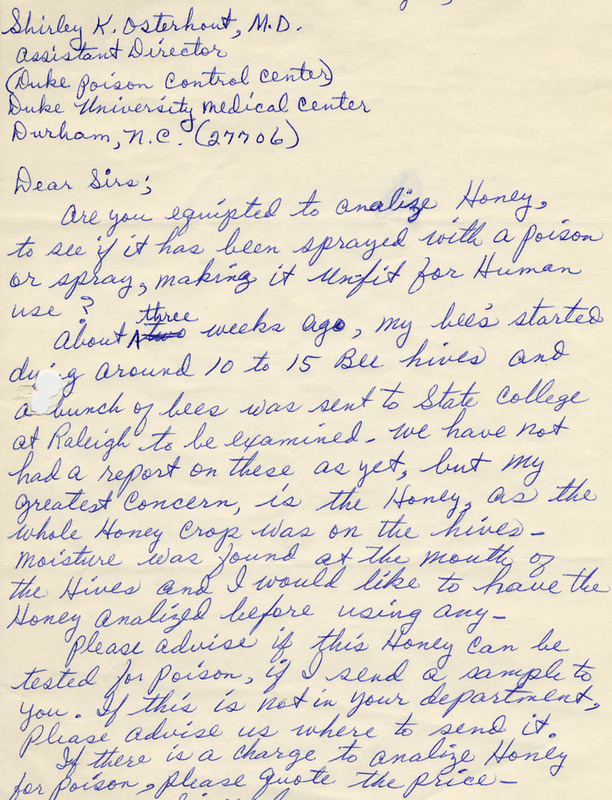 Dr. Osterhout wrote back saying that the Duke PCC could not analyze his honey, but gave him information about places who might be able to do so. Letter to the Poison Control Center from physician. "Each year more than one million cases of poisoning occur in the United States, with over 3000 deaths. . . one-third occur in children under five years of age. . . .Child deaths from poisonings exceed the total of those from polio, measles, scarlet fever, and diphtheria combined." --Dr. Arena in Dangers to Children and Youth, 1971. The Poison Control Center is supported with funds from the Maternal-Child Health Branch (Department of Human Resources). With these funds, a secretary is hired to serve only the Poison Control Center. The center moves to its own office space with its own equipment. Its reputation continues to grow.